Julia Vance sharpens ideas, texts and bombardment of information we receive daily into single words with a physical body: SCULPTURAL MINIMALISTIC POETRY. Catching the words by giving them a tactile and expressive body which compliments the meaning of the word. Words regarding self conception, carved in stone (mainly marble) or cast in bronze, enlightening complexity and depth in single words. Her word sculptures seem as to BEND STONE into tightly stretched surfaces with precisely defined curves and edges. In expressing a 3rd dimension to our 2-dimensional world of lettering and words, she seeks form for the eye and food for the thought. In 2005 Julia received the Norwegian State’s 3-year Artist Grant. She lectures in art universities in both Norway, England and Belgium and is a member of the Royal British Society of Sculptors and the Norwegian Sculpture Organisation. In 2010 she was invited to join the Norway Central Bank’s «Coin Design Advisory Comitee». 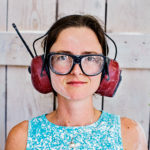 Julia Vance has done several larger official comissions in Norway (County of Larvik, Munch Museum, Vigeland Museum / Vigeland Sculpture Park in Oslo) and exhibited her sculptures in England, Norway, Russia, Belgium, Italy, United Arab Emirates and in Holland. Since 2005 Julia works with her letter- and word sculptures between Oslo/Norway and Pietrasanta/Italy.